Photography has long since superseded the old tradition of wedding portraiture in the traditional sense. Most newly-weds these days are happy to settle for an album full of photos, and very few ever give a thought to the notion that they might have a wedding portrait painted to mark their big day. It's a shame really, that this lovely branch of portraiture has largely disappeared, because the few good examples that have been passed down through the ages, provide us with a privileged glimpse of special occasions that would otherwise have been lost to us. Many of these old-fashioned wedding portraits are now reprinted in the form of gift cards, whilst others still hang proudly on the walls of descendants of the original sitters. I've collected a few examples here for you to enjoy. The young couple kneel on scattered rose petals to receive a blessing before marriage, whilst their friends and family look on. The wedding appears to be taking place at home, and the tables are dressed and prepared to receive the wedding feast after the ceremony has taken place. The bride is dressed in white, and appears very shy and demure as she stares down at the confetti, whilst her groom gazes upwards at the clergyman. This image is very beautiful and serene, and it is a very good example of the excellent genre paintings of Pascal Dagnan-Bouveret. Pascal-Adolphe-Jean Dagnan-Bouveret (January 7, 1852 – July 3, 1929), was born in Paris, France. 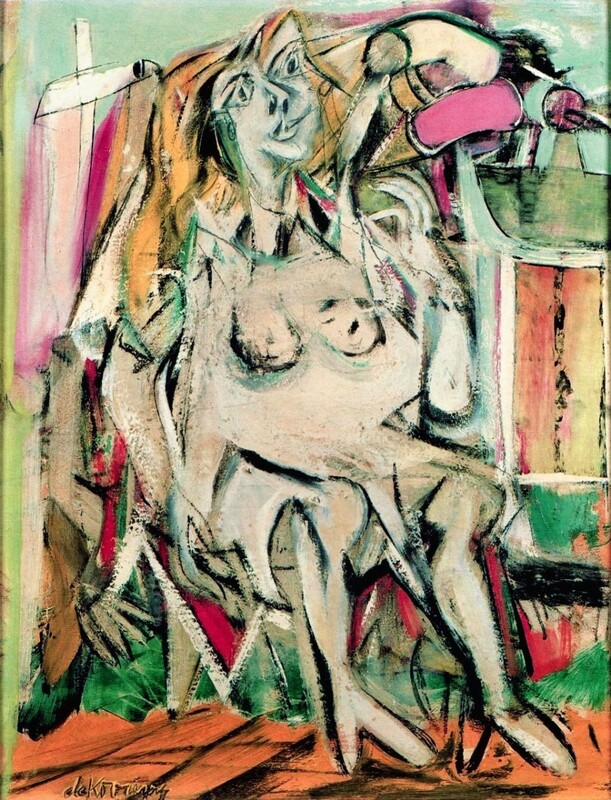 He was raised by his grandfather after his father, a tailor, immigrated to Brazil, and he later became one of the leading members of the Academic school of artists. 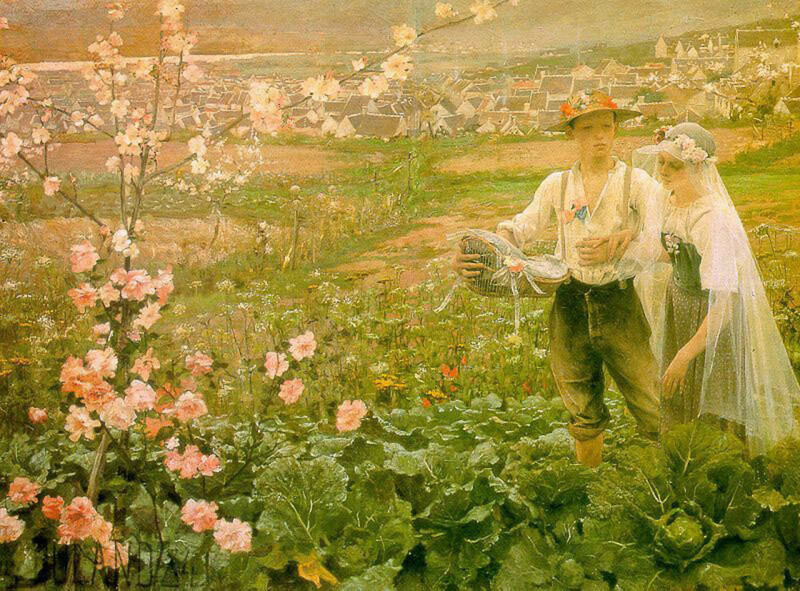 His wonderful paintings give us a flavour of French peasant life in the late nineteenth and early twentieth centuries. Edward Blair Leighton was born on 21st September 1853 and died in September 1922, having enjoyed a long career as a painter of figurative and narrative art. His work is most closely associated with the Pre-Raphaelite and the Romantic Art movements. 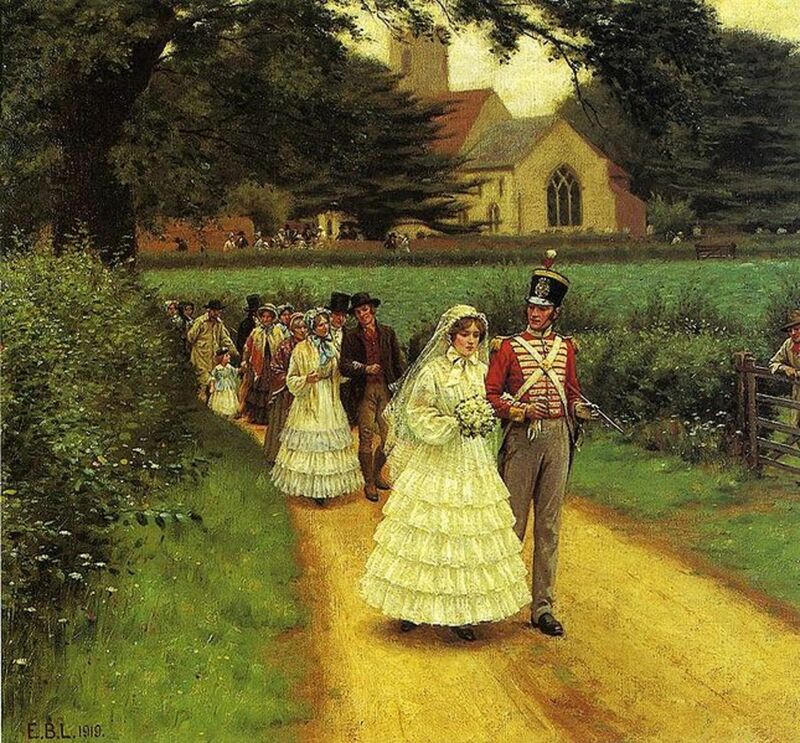 The Wedding March was painted almost at the end of his long career, and it's a really lovely example of his work. The bride and groom lead the wedding party from the church, down a leafy country lane, partially shaded by the long branches of over-hanging trees. The bride is dressed very demurely in a long white gown, and is wearing a bonnet beneath her veil. She is arm in arm with her new soldier husband, and he, decked out smartly in full uniform, is giving her a very loving look. All the fields and hedgerows that surround them are green and fresh, symbolising life and nature, and love in full bloom. I've included this painting, also by Edward Blair Leighton, both because it is beautifully painted, but also because it is very dramatic. This is obviously set in a historical context. The groom and his new wife are surprised on the church steps by a knight in full armour, not an everyday occurrence these days! The groom appears to be in Tudor dress, whilst his wife's outfit is more suggestive of the medieval period. The knight, in his shiny armour and red tabard appears to be on a serious errand, and the title of the painting gives us a clue. The 'Call to Arms', apparently, must be obeyed even on your wedding day! Leighton's skillful attention to detail is apparent throughout the painting. The stunning, pre-Raphaelite bride is wearing a gorgeous flowing gown, richly embroidered, with a purse suspended from the waist. She looks very startled to see the knight on the steps and the party of well armed soldiers waiting in the town square. What a start to a marriage! Leighton was a careful, and meticulous artist, producing polished, highly detailed and decorative pictures. Despite the large body of work credited to him, however, and the fact that he exhibited at the Royal Academy for over forty years, he never became an Academician or an Associate. This beautiful, atmospheric painting can be seen in the Rijksmuseum in Amsterdam. We are privileged, as on-lookers, to see the moment when the groom places a ring upon his bride's finger, surrounded by friends and family. This is a very tender moment, lovingly captured in the loosest of brushstrokes. Josef Israels (27 January 1824 - 12 August 1911) was born in Groningen in the Netherlands. His parents were keen for him to go into business, and the young Josef had to push hard to be able to realise his artistic ambitions. Eventually, however, he was sent to Amsterdam to study in the studio of Jan Kruseman, and to attend the drawing class at the academy. He spent a further two years studying and working in Paris, before returning to the Netherlands, where he lived and worked throughout the rest of his long life. 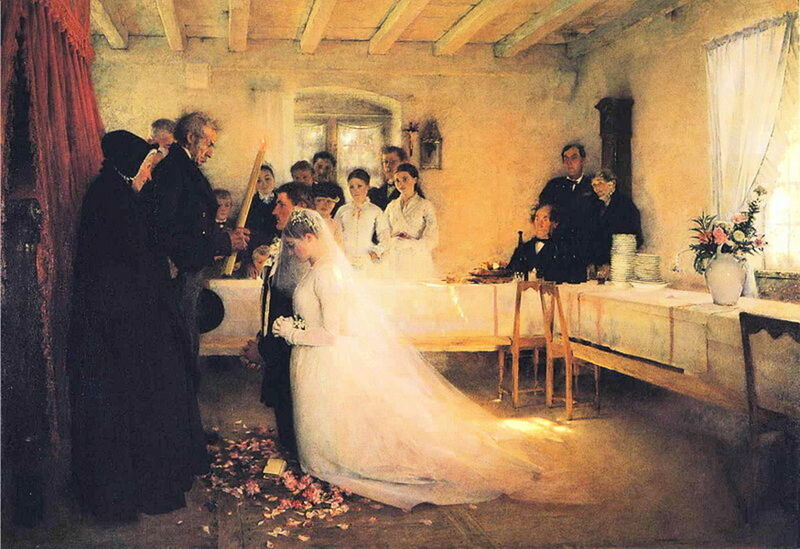 Marriage Innocent by Jean-Eugene Buland, 1884. Courtesy of Wiki Commons. I haven't been able to find a great deal of info on the artist Jean-Eugene Buland (1852 - 1927), as there are only the sketchiest of details available on the internet. He was however, a successful, and reasonably prolific artist who favoured a naturalistic style, and apparently was greatly influenced by photography. The naturalistic approach is show-cased here in this colourful scene, full of rich detail. The young couple are decked out in their wedding finery, she in a veil, and he with wedding flowers decorating the brim of his hat. They are a very young couple with a lifetime of experiences ahead of them. The groom is clutching what appears to be a small baby's crib. I don't know if this is symbolic, and suggestive of the wish for their union to be blessed with children, or whether they have, in fact, pre-empted their nuptials, and already have a child. Whatever the correct version is, the picture itself is a delight. I couldn't resist including this lively scene of a wedding dance in a barn. 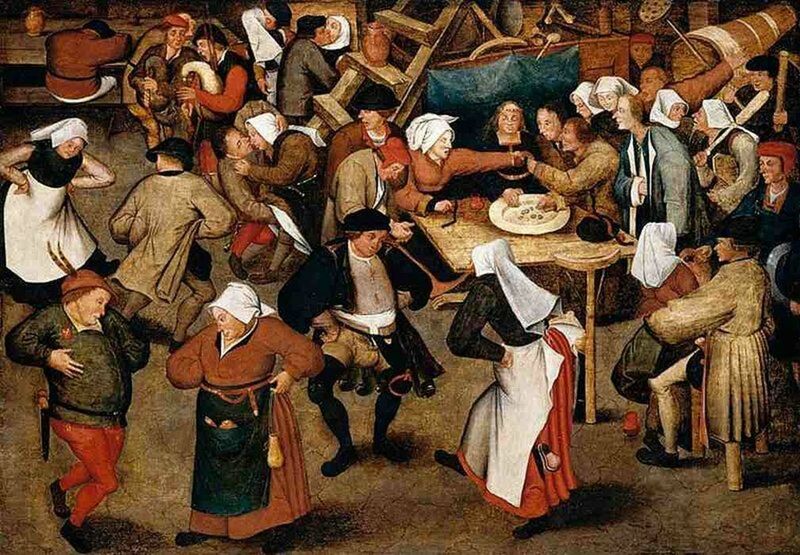 Brueghel's cheeky painting needs more than a casual glance to be fully enjoyed. Certainly the party-goers at this wedding reception know how to have a good time! Check out the dancers strutting their stuff on the dance floor, plus the ardent young man eagerly fondling his partner's thigh, whilst other couples kiss and canoodle in the background. Pieter Brueghel the Younger was the oldest son of the renowned sixteenth-century Dutch painter Pieter Brueghel the Elder and Mayken Coecke van Aelst. Pieter was only five years old when his artist father died in 1569. His mother also died in 1578, leaving Pieter, along with his brother Jan and sister Marie, orphaned. The three Brueghel children went to live with their maternal grandmother Mayken Verhulst (widow of Pieter Coecke van Aelst) in Antwerp where it is believed that Pieter entered the studio of the landscape painter Gillis van Coninxloo (1544-1607). The 1584/1585 registers of Guild of Saint Luke list "Peeter Brugel" as an independent master, and by 1588 he felt sufficiently successful and prosperous to embark on married life. He and his bride, Elisabeth Goddelet, went on to have a large family of seven children. 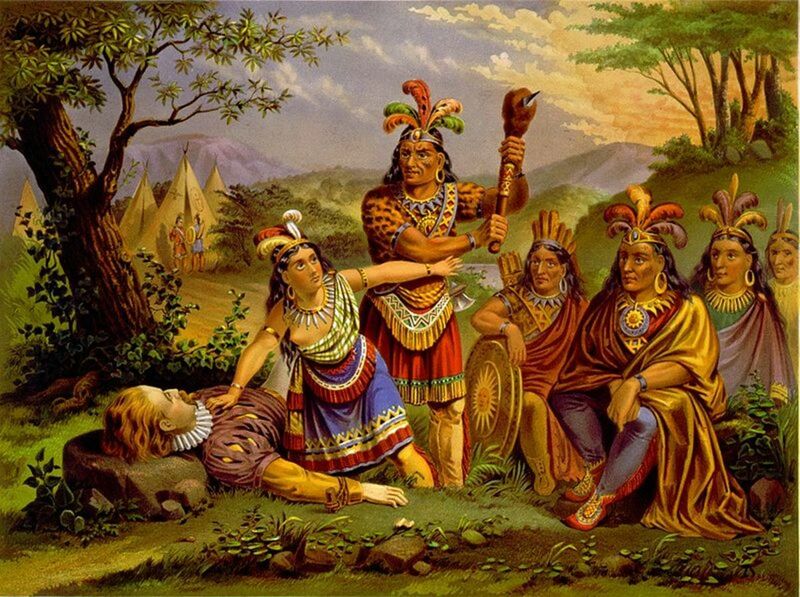 I wonder if their wedding celebration was anything like the one in his painting? 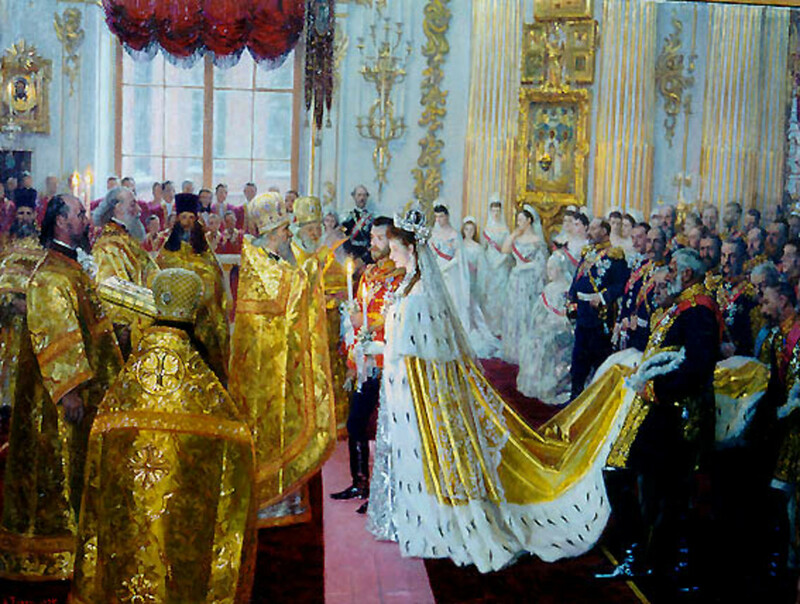 Laurits Tuxen's glorious painting of the wedding of Tsar Nicholas II of Russia and the Princess Alix of Hesse-Darmstadt, was completed in 1895, the year after the marriage took place at the Chapel of the Winter Palace, St. Petersburg. If you look closely you can see portraits of some of Europe's crowned heads amongst the guests. From left to right - King Christian IX of Denmark, the Dowager Empress Maria Fyodorovna, the Grand Duchess Olga Alexandrovna, the Grand Duchess Xenia Alexandrovna, Olga Konstantinovna, Queen of the Hellenes, the future King Edward VII, the Grand Duke Georgy Alexandrovich (son of Tsar Alexander III of Russia) and Prince Heinrich of Prussia (son of Kaiser Friedrich III). The picture is on display at Buckingham Palace. Laurits Regner Tuxen was born in Copenhagen, Denmark on 9 December 1853, and died in Copenhagen on 21 November 1927. This tiny jewel-bright water-colour was painted by Rossetti in 1857, and it now hangs in the Tate Gallery in London.The painting was conceived while Rossetti and other artists were completing a series of medievalist murals in the Oxford Union. It was whilst In Oxford, that Rossetti first met Jane Burden, later Mrs William Morris, and he immediately asked her to pose for this painting. 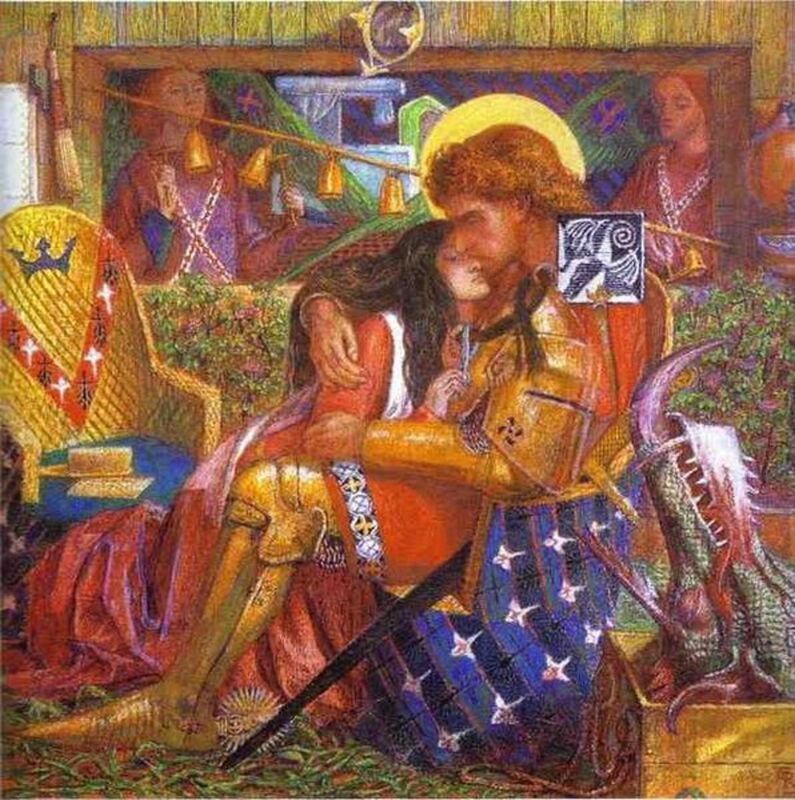 Thus Princess Sabra, threading a lock of her hair through St George's helmet, suggests the early stirrings of an infatuation that would last throughout Rossetti's marriage to Lizzie Siddal, and would later threaten the friendship that he had with the Morrises. Prince George has presented his bride with the head of the dragon. Certainly more original than a cooking pot or a toasting fork! This painting shows the wedding ball of Anne, Duke of Joyeuse, and Marguerite of Lorraine in Paris on 24 September 1581. Joyeuse was the favourite of King Henry III of France, and he personally arranged the marriage of his friend to the Queen's sister, Marguerite. 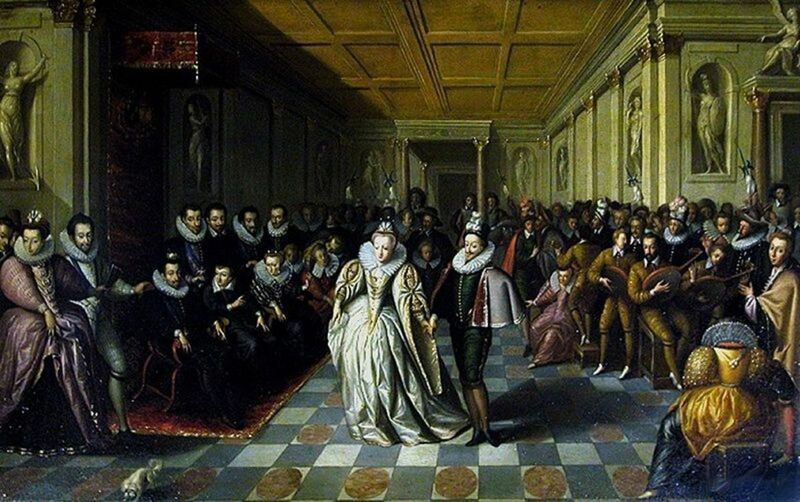 The newlyweds are placed in the centre of the picture; with Henry III, Catherine de' Medici and, Queen Louise are seated on the left with the dukes of Guise, Mayenne, and d' Epernon standing behid them. The Duke was to die childless, at the tragically young age of 27, having served his king well in a number of battles and skirmishes. His title was succeeded by his younger brother. 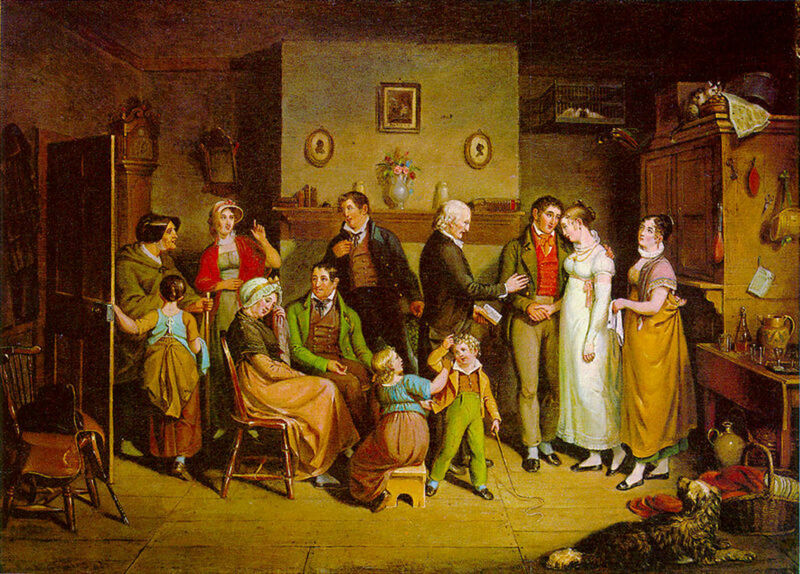 "The Country Wedding," was painted in 1820 by German-American artist John Lewis Krimmel. It shows the marriage of the daughter of a Pennsylvania farmer in the late 1810's. The ceremony is conducted at home by a visiting clergyman, and the bride's wedding dress would no doubt be used as her regular "Sunday best" dress for the next few years, hence the hem is an inch or two above the ankle, rather than floor-length with a train behind, as might be expected in a wealthier home. She happens to be wearing a white dress, but wedding dresses were often other, more practical, colours during that period. The bridesmaid is holding the bride's right glove, so that the bride can have direct contact with the groom's hand. 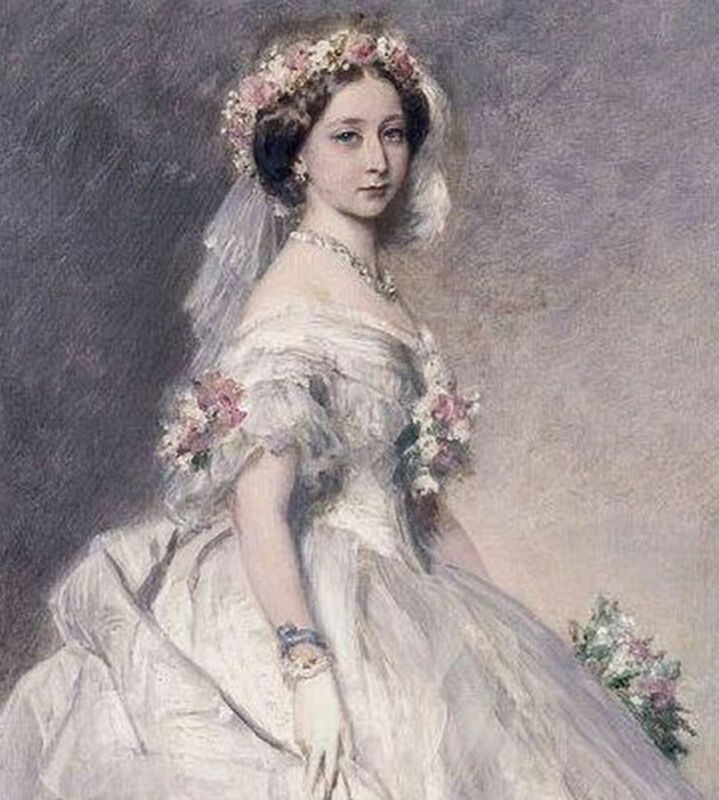 Queen Victoria's 19 year old daughter,Princess Alice was married to the German Prince Louis, heir to the Grand Duchy of Hesse on 1st July 1862. It was a private ceremony held at Osborne House on the Isle of Wight, and the Queen described it as being 'more like a funeral than a wedding' because the Royal household were still very much in mourning for the princess's father, Prince Albert who had died six months earlier. This painting by the artist Franz Xaver Winterhalter (1805- 1873) shows the young princess looking serenely beautiful in her lovely white dress and veil. Sadly, the marriage was not destined to be a happy one, and the Princess threw herself into charitable causes including the Princess Alice Women's Guild, and the improvement of military field hospitals during the Franc-Prussian war. The Princess died from diptheria at the age of 35 whilst holidaying in Eastbourne in the UK. 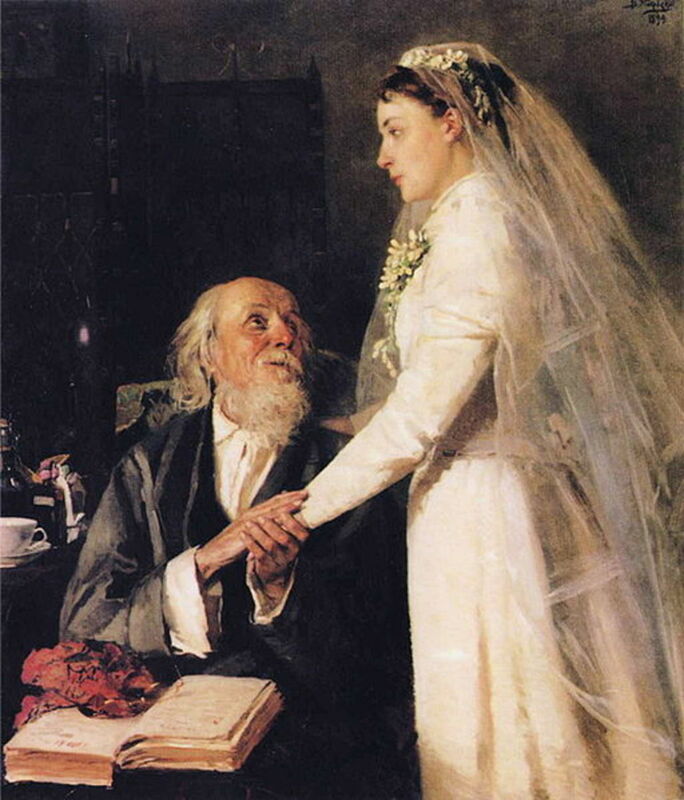 Vladimir Makovsky has captured a poignant moment in this young bride's life. It's difficult to read her expression. Is she happy? Sad? Resigned? What is clear, however, is that she will be very much missed by her Papa, and his look of love is beautifully captured here. The bride's white bridal gown and veil shimmer with reflected light, and the flowers in her hair, and the mistletoe corsage are carefully painted. Hi Jane, I wonder which painting you were searching for? Was it a specific one, or just an old-fashioned wedding picture? Glad you found what you were looking for in either case! A gorgeous collection of paintings! 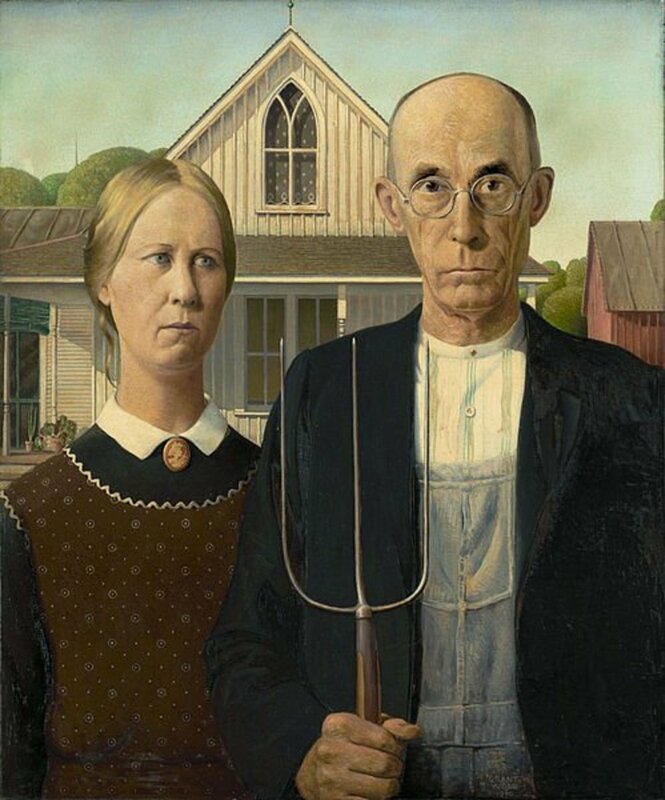 You had just what I was looking for (found it on Google under "old painting of bride and groom." Thanks! Hi Wedding Secret, thanks for stopping by and commenting. I'm glad you enjoyed it. Thanks for stopping by Wedding Planner. I like 'Mariage Innocent' too, though I don't understand what the cabbages are about! Hi Trohnjem, thank you for visiting and leaving a comment. I'm glad you enjoyed the paintings. I really enjoyed this, it gave a good view at the different cultures of weddings. 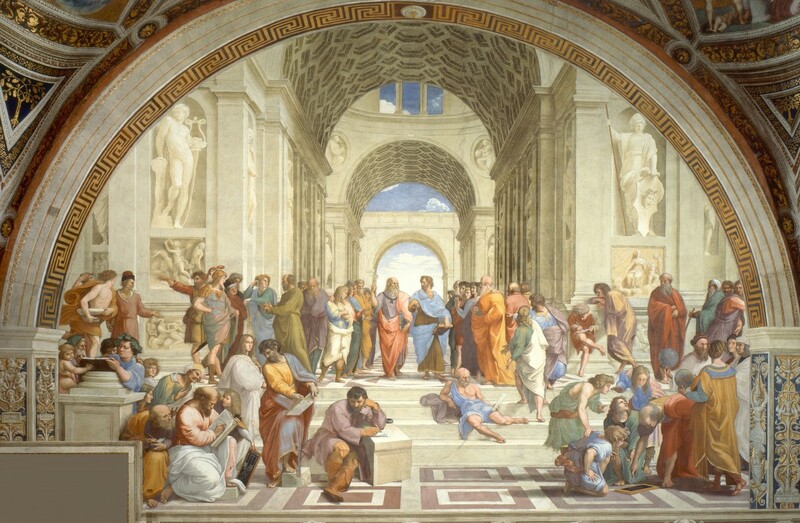 The art history was really nicely laid out and I really liked reading it. The history of is was well worded actually. Nice hub. Hi Dolores, thank you for the compliments, and I'm glad you enjoyed the hub. I have to agree about the big, showy weddings that are so popular these days. The simpler affairs are often the most enjoyable, and at least you don't have the stress of laying out the cash for them either! Amanda, great wedding paintings. I love your art series. The pictures are great and the text is just right, not too long or too short. Looking at the weddings above, seems to me that a lot of brides, these days, are trying to duplicate royal weddings. Give me the simple peasant wedding. More fun and prettier in the long run. Thanks Betty. I enjoyed searching them out. A nice collection of paintings. They are more diverse than I would have expected. Thank you IslandVoice, Mariage Innocent is a really sweet painting. Love amongst the cabbages! I'm sure there must be some kind of a story behind it, but I haven't been able to find it so far. Bravo!!! Always a delight to read your writings. Here, I love all, but i pick 'Marriage Innocent' by Jean-Eugene Buland as my favorite. Hi DeBorrah, I haven't clocked up anywhere near as many years as you, but yes marriage can certainly be a cause for celebration. I'm glad you enjoyed the pictures! 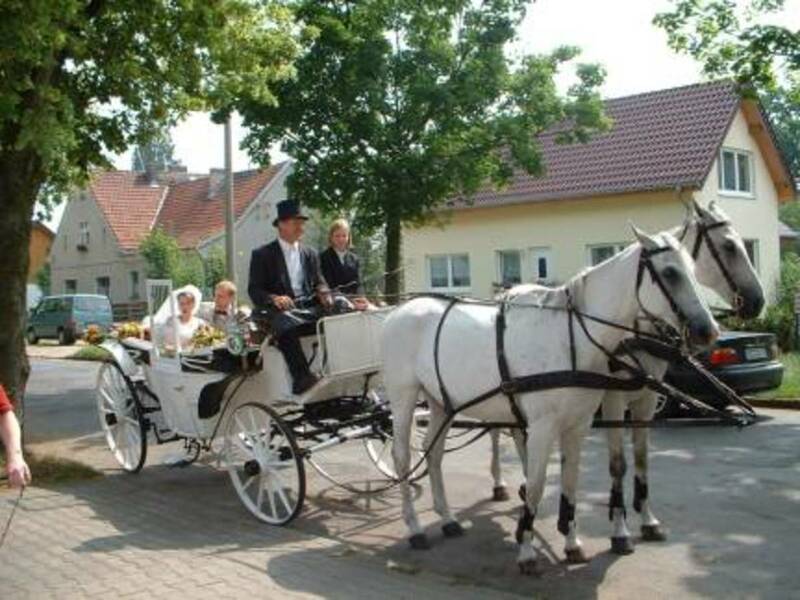 Beautfiful pictures of all sorts of Weddings! Marriage is a wonderful relationship to be celebrated! I am quite thankful for thirty eight (38) wonderful years of learniing and growing together! Hi Shalini, We've also enjoyed 18 years together, though only 12 married. I always find this kind of picture quite touching,too. There's a special pleasure in new beginnings, even if they're other peoples! And yes, the Breughel is very Chaucerian. I always enjoy Breughel's work. It's always so humorous. Loved the colour of the Rossetti painting Amanda - another great art hub thanks! 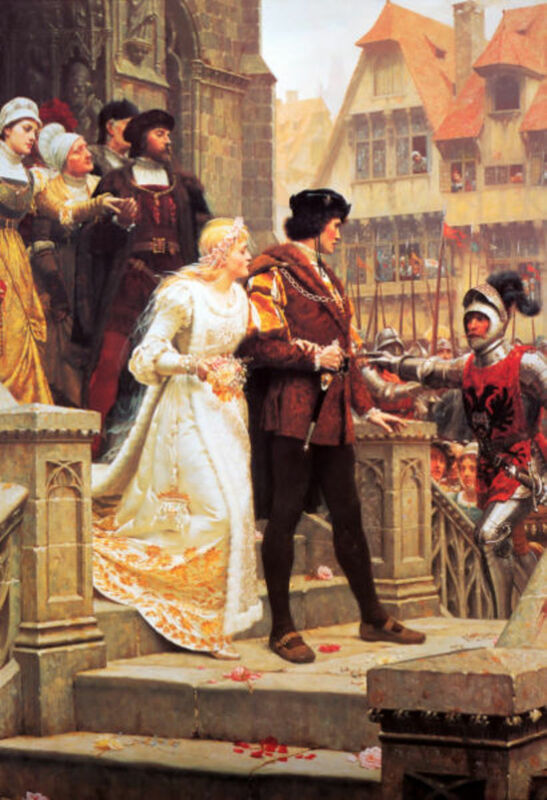 After 18 years of marriage, something about those wedding pictures still touches the heart:) The Breughel one is so amusing and rather Chaucerian wouldn't you say? Hi Brian, I believe weddings are a popular subject on the Search Engines, although I'm not so sure about weddings in Art, but I'll have to wait and see on that one. As to marriage itself, I think people still like to get married, after all, any excuse for a party, but as to how serious an undertaking it is these days, well, that's another matter! Weddings, a good subject to write about especially when you write about it so well, it was like a little look into the history of marriage, a concept I believe has been in decline for a while . Hi Helen, and thanks for your kind comments. Hi RNMSN, as a dragon lover, I can see why you'd favour the Rosetti. The .22 ga rifle as a wedding gift is a tad unusual, (you'd have a lot of difficulty acquiring such a gift here in the UK!) but I'm sure he had his reasons! Congratulations on your 28 years. I've a while to go yet.. Fantastic read you have put everything into this. May I learn from your work. waa-hoo Amanda!! Great Hub! my favorite is Rosetti, hey what can I say, I am a romantic...and a dragon lover so there you see? Hi Bob, Four times, eh? I'm on number two myself, but I'm hoping to stick at that! Glad you liked the paintings. I enjoyed picking them out, and I tried to get a variety. The Breughel really amused me. I just love the way the wedding guests are flinging themselves around on the dance floor. It's better than Saturday Night Fever! Hi Storytellersrus, happy anniversary for yesterday. You're a little ahead of us, as we've only clocked up 12 years so far, although we've been together 18 years. It took me a while to cave in! 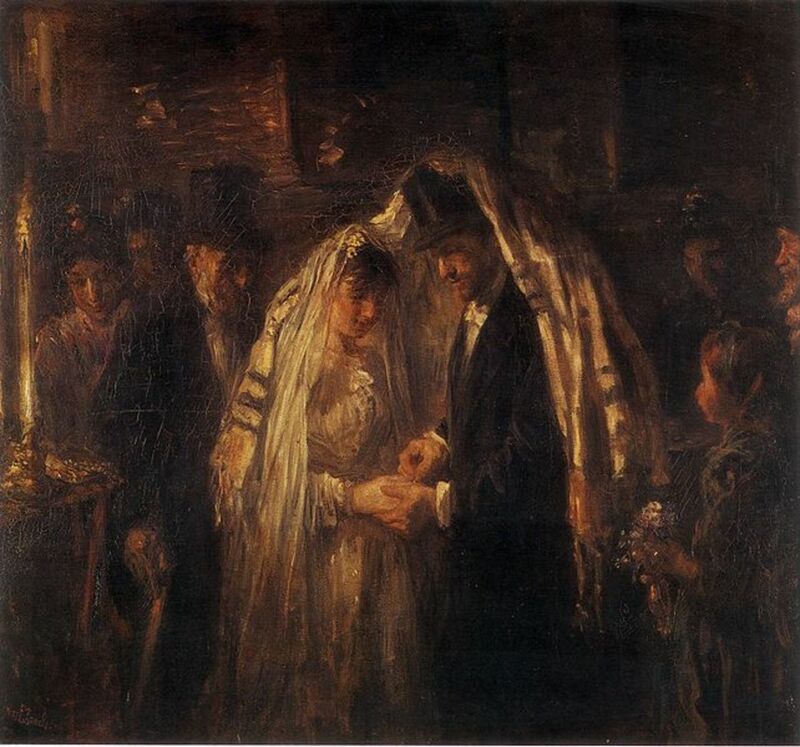 Hi Knell, my favourite is the Jewish Wedding because of the painterly brushstrokes, and the sense of intimacy captured on the faces of the bride and groom. The Wedding March is sweet too. You can't beat an English country wedding, those lovely old churches, the bells ringing out, the sweet voices of the choir, and all the guests in their finery! Impressive, well constructed article, as usual, Amanda. Gorgeous, rich and sensual paintings. Not my favourite subject, I must say, I was always so bad at it! But then, I only tried four times, perhaps I should not have given up so easily. I love this and the timing is perfect- we achieved 24 years of married... survival... lol... yesterday!!! Thanks for a great hub! 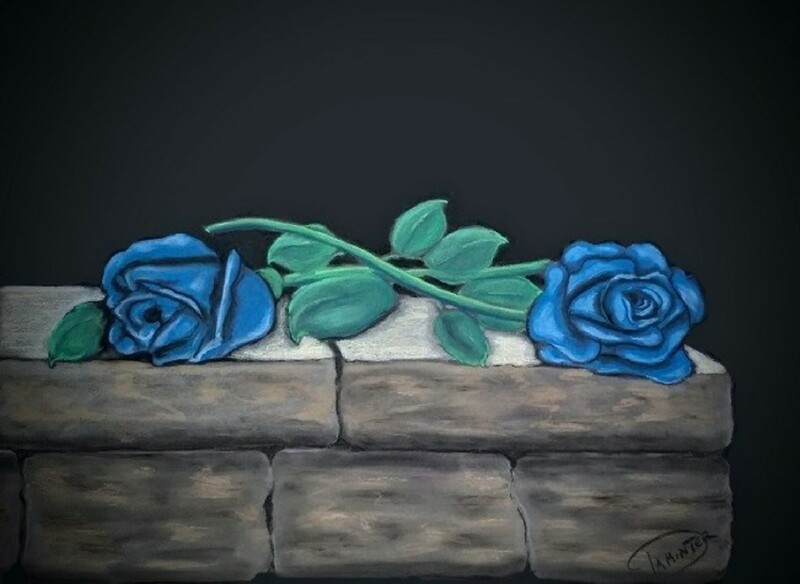 A series of lovely paintings, really enjoyed reading your hub. I liked the Blair Leighton picture down the country lane, reminded me of my own, except of course it rained, I didn't have a uniform on and you could never describe my wife as demure.